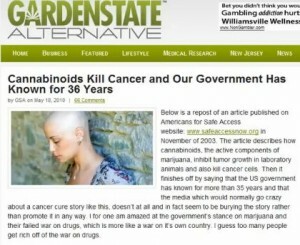 A new study published in Nature Reviews-Cancer provides an historic and detailed explanation about how THC and natural cannabinoids counteract cancer, but preserve normal cells.Link to article: http://www.gsalternative.com/2010/05/... Also Link to the documentry "Run from the Cure": http://video.google.com/videoplay?doc... Rick Simpson Story After a serious head injury in 1997, Rick Simpson sought relief from his medical condition through the use of medicinal hemp oil. When Rick discovered that the hemp oil (with its high concentration of T.H.C.) cured cancers and other illnesses, he tried to share it with as many people as he could free of charge. When the story went public, the long arm of the law snatched the medicine - leaving potentially thousands of people without their cancer treatments - and leaving Rick with unconsitutional charges of possessing and trafficking marijuana!